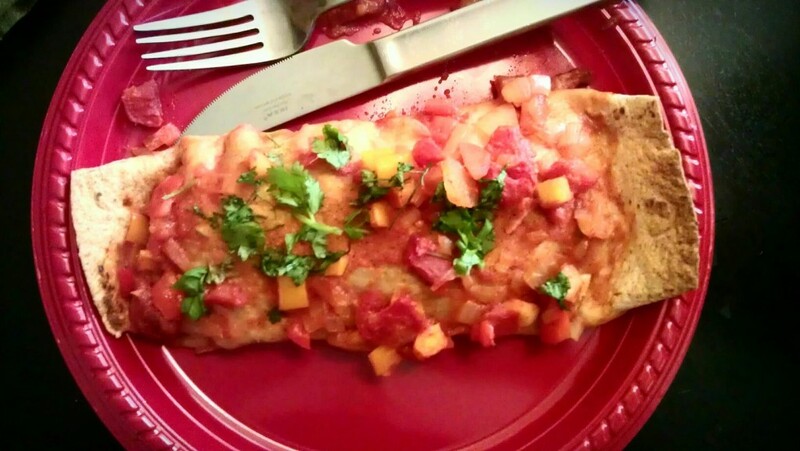 Steak Enchiladas - Kosher In The Kitch! 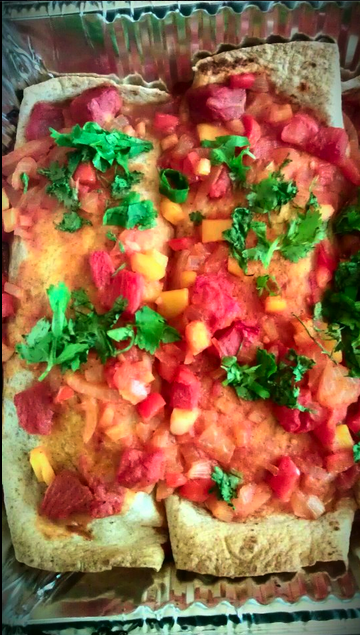 Steak Enchiladas - Kosher In The Kitch! 2. Combine olive oil, 1/4 tsp. cumin, 1/4 tsp. chili powder and pepper steak in a large ziplock bag. Marinate in fridge for 20-30 minutes. 3. Place rice and water in a pot and bring to a boil, then simmer and cook until water is absorbed. 4. While the rice cooks and the steak is marinating, saute onions in a large frying pan until golden. Add in garlic. Cook for several minutes before adding the red and yellow pepper. Mix well and cook for several minutes then add the diced tomatoes and tomato sauce. (remember to reserve 1/2 cup of sauce on the side) Add spices and mix well. Cook until pepper is tender. 5. While the tomato and pepper mixture cooks, cook steak strips until no longer pink. 6. Take the 1/2 cup of reserved tomato sauce and pour on the bottom of a 9×13 baking pan. 7. Take the whole wheat wraps and one by one fill it with brown rice, tomato, onion & pepper mixture, steak strips and some chopped cilantro. Roll over and place in pan with rolled side facing down. Once you have filled up the pan, pour some of the remaining tomato, onion and pepper mixture on top then place in oven and bake on 400′ for 15-20 minutes. Sprinkle on some fresh chopped cilantro before serving.